Our pregnancy hit a little bump in the road and we had to make an emergency visit to the doctor today, but it looks like all is well and the little beans are just fine. 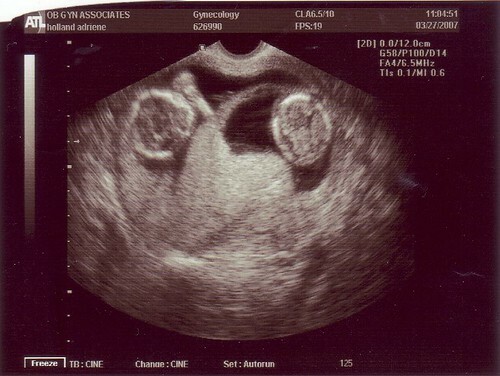 They are healthy and growing and wiggled around a little for us when the doctor took ultrasound pictures. On the upside of this whole deal, we got more ultrasound pictures! ….and for more picture-y goodness, here’s Adriene, showing just a little! Update from Doctor’s Appointment #2! Adriene here – I just got back from our second doctor’s appointment. So far, so good! Both babies have healthy heartbeats, although they once again surprised me and gave me an ultrasound because they couldn’t distinguish the individual heartbeats on the Doppler. Baby A was putting on a little show for us and was wiggling around and very active, with a heartbeat of 166. Baby B was a bit more subdued in movement, but still had a strong heartbeat of 132, which led the ultrasound tech to suggest that Baby B was probably asleep! Both are starting to look more and more like babies and less and less like gummy bears! And since this is the second time in a row that they’ve sprung an ultrasound on me unexpectedly, I’m tempted to start making Jeff go with me to all of our future appointments so he doesn’t miss anything! One little thing of concern is that my blood pressure was up just a bit to 140 over 60. While that’s not in the “danger range” or even in the range to consider putting me on meds, that’s one thing she wants me to work on before my next appointment April 19. As she (Dr. Chappell) put it, it’s not “beautiful” for someone at 13 weeks, but it’s not terrible, either. So, she’s not overly concerned. Just something to work on! Other than that, nothing else big to report. We’ll keep you posted, and as Jeff wrote below, maybe we’ll have some tummy pictures for you soon! Not much to report here yet. All systems are normal as far as we know right now and Adriene will be making a routine visit to the doctor this week. It won’t be long before we’ll be posting pictures of her little tummy, I’m sure. In the meantime, we’ll distract you with pictures of the birth of our friends’ daughter. It’s not our babies, but it’s babies nonetheless.